S.S. 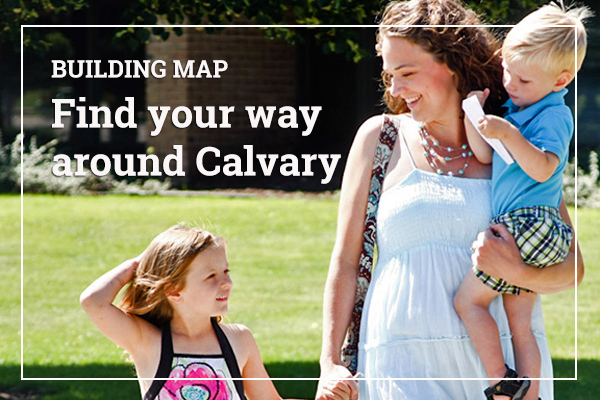 Adventure is Calvary Kids’ Sunday morning program focused on the thrill of discovering God’s Truth. Children embark upon their journey Sunday mornings building relationships with a number of their peers and leaders during small group time before coming together to worship Jesus and receive an energetic presentation of the week’s Bible story at Large Group Adventure. After Large Group, children return to their small groups to rotate through various activity stations which reinforce the day’s lesson or teach Bible Navigation Skills. Classes are held during the 9:00 & 10:45am services for birth through fourth grade (except on Family Service Sundays when only nursery and preschool are available). All children need to stop by the check-in area to receive their name tags and then be escorted by a parent or guardian to the room number printed on their name tag, and checked out by a parent or responsible guardian (high school age or older), bearing the claim tag that was issued upon check-in. First-time visitors will be issued temporary nametags. Regular attendees who have been enrolled and entered in the database will receive a three-part nametag upon check-in. Please inform your child’s teacher of your location for the hour(s) your child will be in Sunday School. This information is necessary in the event that we need to locate you. If you are in the Sanctuary or the Chapel, the call number will be displayed on the boxes at the front of those rooms. If you are somewhere other than these rooms, we will use the information on the sign-in sheet to locate you. Special Needs: Special accommodations can be made for children with special needs. New to Calvary? Contact Shelly Lamport ( ) so we can get to know you and your family.